There is no doubt that Wilton baby shower cakes are the cream of the crop. The Wilton website offers plenty of examples, easy cake instructions, decorating suggestions, and more. 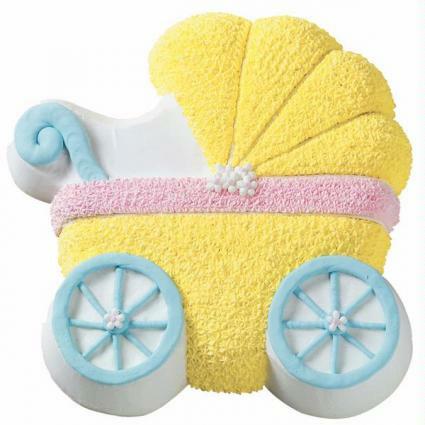 With names like "A Splashy Debut", "Baby Bear Express", and "Twice as Nice", it's easy to understand why Wilton baby shower cakes are popular cake choices for any baby shower. You can find the latest recipes on the Wilton website. Many of your favorites start with a simple classic white cake or golden yellow cake recipe. Preheat oven to 325°F. Grease bottom of pans and line with waxed paper or parchment paper, or use Wilton Cake Release. Sift together flour and baking powder. Set aside. Cream butter and sugar together until light and fluffy. Set aside. Beat egg whites until stiff, but not dry. Set aside. With a mixer at slow speed, add flour mixture to butter mixture, alternately with milk. Beat well after each addition. Beat in vanilla extract. Gently fold egg whites into batter. Pour into prepared pans. Bake until toothpick inserted into center comes out clean. This recipe makes 12 cups of batter. Preheat oven to 350°. Spray bottom of 2 nine-inch rounds with vegetable pan spray. Sift together flour, baking powder and salt. Set aside. Cream butter and sugar together until light. Add eggs and vanilla to creamed mixture and beat until thoroughly mixed.Add flour mixture to creamed mixture alternately with milk, beating well after each addition. Continue beating one minute. Pour into prepared pans. Bake 30 to 35 minutes or until toothpick inserted into center comes out clean. Cool for 10 minutes. Gently run a thin spatula around edge of cake, and remove cake from pans. Cool completely before icing. This recipe yields approximately seven cups of batter. Want to learn more about Wilton baby shower cakes? Why not consider taking a cake decorating class? The Wilton School of Cake Decorating was established in 1929 by Dewey McKinley Wilton, whose philosophy was "learning is best achieved through class participation." The mission of the school is "to provide excellence in cake decorating education for technique mastery and inspiration for creative expression by school graduates." Wilton cake decorating classes are taught at several areas all over the country, with over 125 classes available. Courses are geared for all levels, including beginners and even master courses. To find a class near your area, visit the Wilton website. The objectives that are continually emphasized at the school are straightforward and simple. Perfection of execution is insisted upon, from the smoothest frostings to the size, shape and positioning of every decoration. The dynamic, ever-changing aesthetics of cake decorating are taught, exploring color, developing new motifs and encouraging creative experimentation. Efficient techniques are developed to enhance the creativity of the decorating experience. Wilton baby shower cakes incorporate a variety of decorating techniques, and many of these can be accessed online. Topics include choosing and using decorating bags, decorating essentials, folding parchment bags, transferring patterns, and more. Finally, don't forget to read all the posts about Wilton baby shower cakes and other message boards on the discussion forums. Here you will find links to topics, such as life celebrations, weddings, recipes, products, and general information.